EXIF data refers to the Exchangeable image file format used for supplementing images with rich metadata, such as the camera make, orientation and exposure, color space and dimensions, location where the image was captured, and so forth. While EXIF data adds punch to photo sharing, however, it does bring forward privacy concerns. You don’t want everyone in the world to know where you’re capturing photos, which devices you own etc. 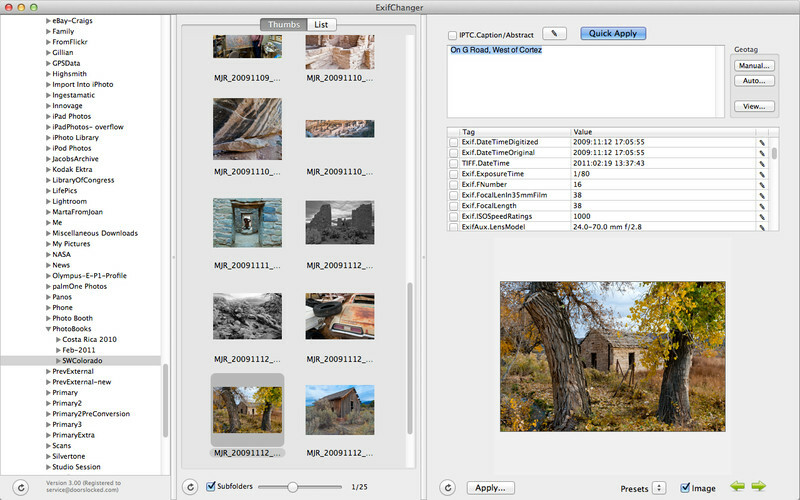 A number of applications and utilities allow you to read, write and edit photo’s metadata. Mac owners can make use of one such app – ExifChanger. ExifChanger is the Swiss Army Knife of EXIF utilities! Use it to change EXIF and IPTC fields, adjust dates and times, view metadata, geotag (from a track log or manually from a map), view photos, export metadata, and define presets with macros. It’s the most powerful and complete EXIF app. • Handles most file types: AI, AIT, ARW, CIFF, CR2, CRW, CS1, DCP, DNG, EPS, EPS2, EPS3, EPSF, ERF, EXIF, GIF, HDP, ICC, ICM, IIQ, IND, INDD, INDT, JNG, JP2, JPEG, JPG, JPM, JPX, MEF, MIE, MNG, MOS, MPO, MRW, NEF, NRW, ORF, PBM, PDF, PEF, PGM, PNG, PPM, PS, PS2, PS3, PSB, PSD, RAF, RAW, RW2, RWL, SR2, SRW, THM, TIF, TIFF, VRD, WDP, X3F. • Uses ExifTool — Actual metadata changes are performed by the well-known, proven, utility ExifTool (included), so processing is reliable and fast. For extra safety, the original file is saved, and can be restored, or deleted when it’s no longer needed. • View Metadata — See the most important fields (EXIF, IPTC, GPS) right on the main screen. See all the fields, even the most obscure ones, in the output from ExifTool. • Adjust Dates and Times — Set images to a date/time you specify, or automatically correct images in bulk by a fixed offset (if your camera’s clock is set wrong). • Geotag — Geotag (longitude, latitude, and altitude), both manually (from a map) and automatically (interpolating from a GPS track). There’s a track manager, to input tracks and view them on a map. For automatic geotagging, adjust both time zone and camera’s time. Geotag manually by choosing the location on a map viewer built into ExifChanger, or by using another geolocation app. Paste the location directly to ExifChanger. • Sace Settings in Presets — Save values for selected fields in a preset, to be applied to images. Handy for setting metadata for standard items like photographer’s name, address, website, and copyright info. • EASY BULK CHANGES — When more than one file is selected, metadata that differs is shown with the notation “mixed”, but still can be changed, making bulk changes very easy. • REVIEW BEFORE COMMITTING — A review dialog shows exactly what changes are to be made to what files, so you can ensure that things will go as you intend before you make the changes permanent. • Thumbnail and List Views — Images in the selected folder(s) are shown as thumbnails or in a list view. Sort the images by name, type, or date. Include only images in the selected folder, or in subfolders also. Optionally, see a large preview image. Quickly move from image-to-image with the keyboard or mouse. • Macros — A powerful macro facility lets you insert the value of one field into another, even to several levels. Macros for file names, EXIF, IPTC, GPS, maker’s notes, and more. • Export Metadata — Based on a template you create, containing plain text and any combination of macros referring to metadata. Use it for generating HTML pages, data files (CSV) for input into a spreadsheet or database, SQL statements, or any other kind of text file. ExifChanges is available in Apple Mac App Store.